Being that I have ultra sensitive skin, I'm rather picky with the products I use. I stay away from harsh cleansers and products that contain perfumes and/or dyes. I've tried TONS of lotions, cleansers and creams over the years and the ones below are some of my all time favorites. I always love hearing about what products work for others, so I thought I'd share 10 of my favorites with you. They all vary in price but I love that some of them can be found at your local drug store. 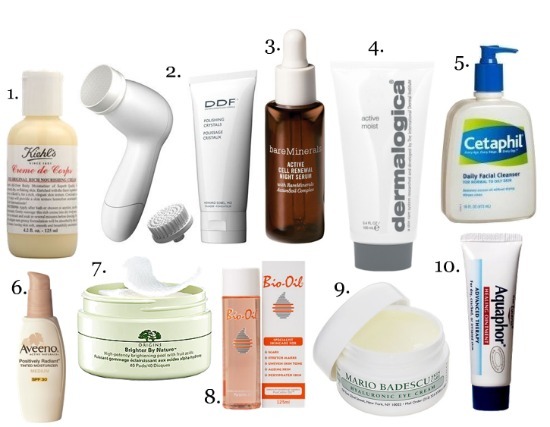 What are your skin care favorites? 1. Kiehl's Creme de Corps Lotion - Favorite body lotion when my skin feels extra dry. 2. DDF Revolve 400x Micro Polishing System - I use this 2x/week to exfoliate. It's like a DIY facial. 3. Bare Minerals Active Cell Renewal Night Serum - I use it day AND night. It's a miracle in a bottle. 4. Dermalogica Active Moist - Light weight, non-greasy facial moisturizer that won't clog pores. 5. Cetaphil Daily Facial Cleanser - Ultra gentle. I never use harsh cleansers to wash my face. 6. Aveeno Positively Radiant Moisturizer w/SPF 30 - I use this on days I don't wear wake up. 7. Origins Skin Brightening Pads - Amazing skin brightener. I use these 2x/week. 8. Bio-Oil - I love mixing a few drops of this with my hand and body lotion for a little extra moisture. 9. Mario Badescu Hyaluronic Eye Cream - I use this day and night, I love it! 10. Aquaphor Healing Ointment - I use this as a lip balm and am quite addicted to it! P.S.- A special thanks to Inna over at Skippy Says for featuring me a guest blogger today! I'm going to have to try that night serum! I've been looking for something like that. Happy Friday! I love Dermalogica and I must try the Bare Minerals serum, have heard great things about it! I use cetaphil too and loooove it. What a difference after using clearasil face wash which was so drying for my skin. I've recently switched to eucerine sensitive skin 30 SPF face lotion too and really like it! I am addicted to my Clarsonic. I use it with Dermalogica's Daily Microfoliant. I also use Purpose to take off my makeup. These are products I swear by. I have super oily and sensitive skin. You should check them out. Curious, what does the Bare Minerals serum help with? i love mario badescu products. they are so gentle, work great, and so affordable. i've used so many products (even ones prescribed by my derm) and badescu products work best! Love your recommendations, it’s always great to see what works for others and what products they use. Girl, I am all over #2, #5, & #10... except instead of DDF (for #2), I use Olay and it's just as good! Great post! I have super sensitive skin as well so I share your pain. I just recently bought the Clarisonic Mia and it has changed my life! Clinique Dramatically Different Moisturizer is also a life-saver! Ooh some of these products are new to me, I am going to have to give these a try! Popped over from Inna's blog, glad to have found you, you have beautiful style! Ooh, my best friend has super sensitive skin. I'll have to show her this post! I have extremely dry skin, Centaphil has something for every skin type. I love the DDF machine - I also have a clarisonic for specifically under the eyes that is magic!!! I used to work in the spa industry and was pretty knowledgable about the skincare lines we provided. Ones I really stand behind are Eminence, Jurlique, and Biodroga. These lines are more expensive but the results are very noticeable after one use. I use them myself. Eminence and Jurlique are completely all natural ingredients. Here are the websites below if you'd like to take a gander:) They really are wonderful products and I think they can help a lot of you ladies out in the skin department. I promise you won't regret it. Happy Friday, all! Love your blog dear! Following you now! Kisses from Romania! I'm so glad you shared your skincare products - I am ALWAYS on the hunt. I use cetaphil too! I love it! I definitely need to try some of these others... the DDF looks amazing. Aveeno lotions are always the best, especially the daily moisturizers! Bio oil is my daily moisturizer and is just perfect for my skin ! I always use oil for face and body ! i love DDF products! they are the one thing i really splurge on. Oh I would die without my Dermologica. Favorite moisturizer ever! Such great tips! I feel like I neglect my skin too much. I have sensitive skin so it's always great to hear about new skin products tht work! I love Aveeno's moisturizer, as well as Burt's Bees and Yes to Carrots. If U can visit my blog and support me! Bio Oil is an incredible product. I use it every day.